Is your business ready for Business Intelligence (BI) software? As BI software continues to improve, more businesses are moving to adopt BI sooner rather than later. Before you make that commitment though, it pays to figure out exactly how much money it will cost you to implement. 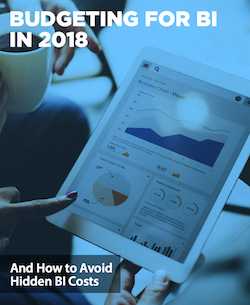 Read our latest guide on Budgeting for BI in 2018 to learn more, including how to determine if now is the right time to invest in BI for your business.